STOCKHOLM -- Being here just to watch isn't easy for Andreas Lilja, but Detroit's other Swedish defenseman has remained in good spirits despite knowing he might be missing his one and only opportunity to play an NHL game in his home country. Lilja is practicing with the Wings, but he has not been cleared to play due to post-concussion symptoms stemming from a hit delivered on him by Nashville's Shea Weber back in February. He hasn't played since. "Of course it bothers me, not only not to play here but to not play at all right now," Lilja told NHL.com. "Every year you get ready for a big season, so of course now it's frustrating. It feels weird not to be able to play." Lilja thought by now he would surely be back in the lineup, but the headaches haven't subsided totally yet and the doctors are fearful of what another blow could do should he return to the lineup too soon. "It's like I'm on hold," he said, still sweating from a morning workout this week. "I don't know what to say. It's been frustrating since February. You figure you get a concussion and you're out 10-14 days, but I'm still there so you just have to wait it out." The entire process has given Lilja time to appreciate what he does for a living. "Sometimes you maybe feel it's a little bit boring with practices and stuff, but I'd give everything to be back playing," he said. "I think you learn to appreciate your position in life and the different things that can happen to you when you play. I think it's awakened me a little bit." Even though he won't be in the lineup Friday or Saturday, Lilja said interest back home is still strong. He has 19 people coming to Friday's game and another 14 heading here for Saturday's game. It's not like it's an easy trip either. Lilja's hometown of Helsingborg is on the southwestern tip of Sweden, near Denmark. He said it's nearly a six hour drive from Stockholm. "It's fun for them even if I'm not playing," Lilja said. "They love this team and my parents, especially my dad, he knows almost all the players. It's fun for them to come watch." STOCKHOLM -- Based on stats from the past years, the Red Wings' third line appears as intimidating as an open-ice hit from octopus man Al Sobotka. Valtteri Filppula is a skilled center who has to produce more. Jason Williams is a hard-shooting right wing who has failed to build on his breakout year from four seasons ago. Ville Leino is a left wing who dominated Finland's SM-Liiga, but spent most of last season in the American Hockey League. Fans easily recognize the Wings' top two lines thanks to the skill, power and grace of Henrik Zetterberg, Pavel Datsyuk, Johan Franzen, et. al., but maybe they should start familiarizing themselves with the flashy Finn, his determined countryman and the Southern Ontario power shooter. The Wings' third line may not come with the same fanfare and statistical boom as their terrific top two lines, but it's built to produce just the same. "I'd rather be a scoring line than a checking line," Leino told NHL.com. "Obviously the pressure is always there in professional sports and it's a good thing. It keeps you on your toes. It's good when someone expects something out of you." Leino, Filppula and Williams were put together right at the start of the Wings' training camp in Traverse City, Mich. because Wings coach Mike Babcock thinks they can recreate some of the success from last season's third line of Jiri Hudler, Filppula and Mikael Samuelsson, who combined for 54 goals and 83 assists. Hudler is in Russia now and Samuelsson is in Vancouver. "We're basically hoping that Leino can replace Hudler and Williams can replace Samuelsson," Babcock said. "That gives you a real good third line." What's interesting about this third line is it's not overly different from the first two lines save for the level of skill and experience. Filppula, who had 12 goals and 28 assists last season, doesn't have the same flare and cachet as Zetterberg or Datsyuk, but he can nonetheless bring the puck into the zone with some pizzazz to create scoring chances. Leino hasn't proven to have the same grit as Tomas Holmstrom or Dan Cleary, but he can battle hard in the corners and he knows how to produce. He led the SM-Liiga with 77 points, including 28 goals and 49 assists, in 2007-08 before signing with the Red Wings. "Hudler is a gifted, gifted guy on the power play and makes unbelievable plays, but Leino is a bigger man and harder on the puck in the offensive zone," Babcock said. "As he plays with us he'll get more and more pace." Williams may not play with the same power as Todd Bertuzzi or Johan Franzen -- he's only 5-11 and 185 pounds -- but he has a shot to be feared and an ability to find himself some open ice. He's manning Samuelsson's old spot on Detroit's second power-play unit. "I think all three of us are smart hockey players and we think the game at a fairly high level," Williams told NHL.com. "Once we get the confidence and things start going right for us we will be able to do certain things as our top two lines do." They all come with their own baggage, though. For instance, Williams peaked in 2005-06 when he had 58 points and was a plus-4 in 80 games with the Red Wings. Since then, he has only 115 points and a minus-5 rating in 201 games with Detroit, Chicago, Atlanta and Columbus. "Willy can really shoot the pill, but he's got to take a step in his career," Babcock said. "If he wants to be a player that plays in one place he's got to play with more grit, turn over the puck less and take it to another level. He knows it and I know it." Leino is just green after playing in only a handful of NHL games last season. He spent most of his first season in North America in Grand Rapids, where he had 46 points in 57 games, but now he's being asked to take to do something he's never done before. "He sees the ice well, thinks the game at a high level, and when you think a game at this level it helps you that much more," Williams said. "Sometimes guys are put together with guys at their same level and they break out. Give it a little bit of time. He's sort of getting his feet wet but he has proven he can put the puck in the net." Filppula might carry the least amount of baggage but he also might have the most to prove. Babcock praises him, but Filppula has to find a way -- and it's not easy -- to step out of the shadows of Datsyuk and Zetterberg and become an impactful scorer this year. 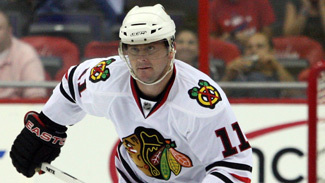 He's part of the group that has to pick up some of the goal scoring that was lost when Marian Hossa signed in Chicago. "I mean, Fil was our No. 2 center the year we won the Cup because Pav and Z played together," Babcock said. "Filppula is a great two-way player and very strong. What Fil has to do to get recognized is he has to score more." Part of that comes with opportunity, and Babcock definitely plans to give a lot of rope to his third line because, as he has repeatedly said, he doesn't want stars like Zetterberg and Datsyuk to be playing 20 minutes a night. "We play a lot with four lines so that means everybody has to do well," Filppula said. "It can't be one line or two lines. Everybody has to do their part. It's good and it's a challenging thing."